I saw this car in traffic and took a picture with my cell phone, but I have no idea what kind it is. It's large, and looked far better than this pic shows. Anyone know what it is? I'd guess Pontiac, Buick or Olds. The rear fender doesn't seem right for a Chevy. Pontiac used to have an Indian head hood ornament, Buicks had the 'portholes' along the side. +- 1 on the year. Looks like a Mercury. Late 40's, early 50's. Looks like a 1950 (or so) Buick. ETA: Here's a 1950 Buick. Does this look like the car? It looks a little different from the cell phone picture but I can't tell if it's because it's a different car or if it's the poor image with reflections, etc. If that '50 Buick isn't it, it's certainly very close! I honestly can't make out my picture well enough to be sure, but you guys have at least given me a real good idea of what it is. I love those cars from the 40's & 50's. So cool!! 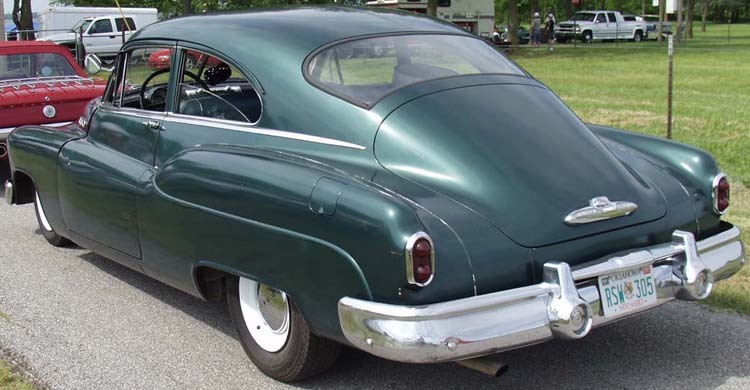 +1 on it being an early '50s GM product, most likely a Buick or Olds, maybe Pontiac or Chevy....not a Cadillac though. If it's been given the whole leadsled treatment then it might be a bit harder to tell. Taillights, grills, trim get swapped around & modified, rooflines chopped, fenders stretched, etc.